I saw it for $2.06 this evening, which means it's $2.03 at Wal-Mart if you go inside the store first and purchase a gift card to pay for your gas. I'm so thrilled. We're going on a camping trip next week, pulling our 5th wheel travel trailer. We don't get very good gas mileage when pulling it, so the lower prices will help considerably. $2.99 this weekend in PDX, first time it's been under $3 in ages. 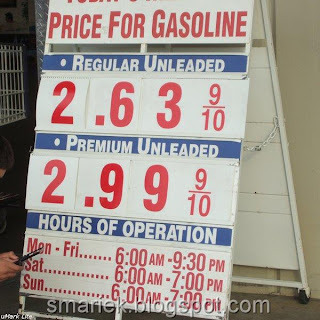 Gas is pricier in California, but is way less than a few months ago. I guess that will just give us more money to buy the little necessities in life (like yarn). Thank you for your tip with regards to cable scarves gobbling up yardage - I had not thought of that. The yarn only gives its weight (no yardage) so I will definately look for a lacier pattern. Great news on the gas though. We are at 2.86 -- I was so excited! Most of the stations around here are ranging from $2.199 to $2.299. The lowest gas price I have seen here in Topeka is $2.099/gallon. There are a couple of stations that tend to have lower prices than that one, but I did not go by them on my way home this evening. I suspect we may even see $2/gallon gas at some stations around the election. Of course I am sure the prices will go back up after the election. I was in West LA today and I paid $2.95 today; saw a no-name station for $2.93. I was surprised. The nearest station to our house was under $3.10. Got it for $2.13 this morning in central Ohio and saw somewhere else at $2.09. It's been falling pretty steadily, although I expect it to shoot up after the election. 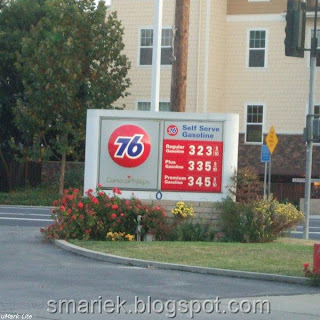 $2.88 yesterday in Southern California. That's a bargain!!! We're seeing 92.9cents/litre....It's funny to me to see what a wide range you have. Here, it's considered a huge difference if one place is 92.9 and another is 93.5!